A group of 7 regional MPs have torn up photos of Spain’s King Felipe in the Catalan Parliament. 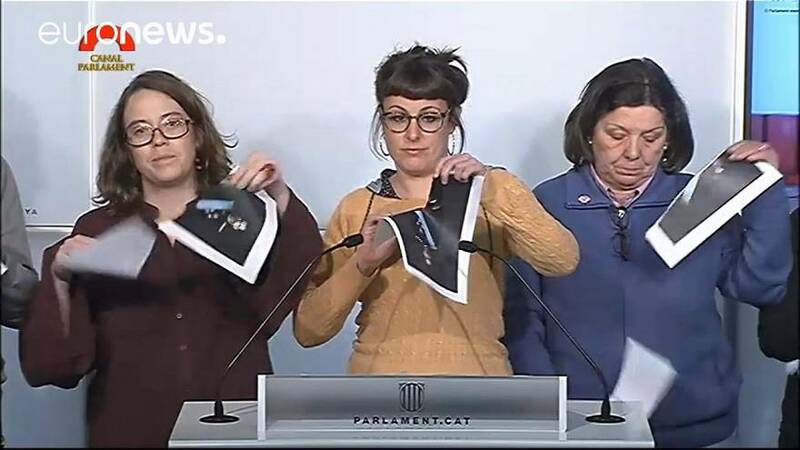 Before ripping the image, one of the MPs told reporters that “The message from the Spanish government in Madrid, of a hard line against those who want Catalan independence, is clear”. “We also want to send a message back: We won’t step back, and they won’t stop the independence referendum”. The provocative action comes after the Audiencia Nacional (the Spanish Court responsible for terrorism, serious drug dealing, and corruption cases) ordered the arrest of five young activists, who stand accused of burning photos of King Felipe VI and copies of the Constitution during a rally on Catalan National Day on September 11. The Court ordered the arrest of the activists after they failed to attend a hearing last Wednesday. Independence-activists in Catalonia have strongly criticised the arrests. The CUP MP, Benet Salelles, defended the actions, saying that “we are a country in which fire forms part of our culture, we will continue to use it”. Whilst burning photos of the King is a crime in Spain, it is unclear whether or not the same is true of ripping up pictures of the monarch.